Augmented Reality will merge with 3D Internet. The Augmented Reality (AR) technology is a field of computer research, which functions by enhancing one’s current perception of reality by the combination of real-world and computer-generated data. The elements of a physical real-world environment are augmented by virtual computer-generated imagery. Real or fictitious information are ‘mapped’ on to the real world to create new experiences. Currently, most AR research is concerned with the use of live video imagery which is digitally processed and ‘augmented’ by the addition of computer-generated graphics. Who came up with the term AR? 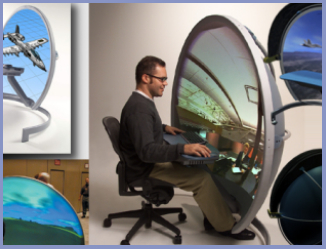 Tom Caudell, a researcher at aircraft manufacturer Boeing, coined the term “augmented reality” in 1990. He applied the term to a head-mounted digital display that guided workers through assembling electrical wires in aircrafts. What are other definitions of augmented reality? Augmented reality is an environment that includes both virtual reality and real-world elements. 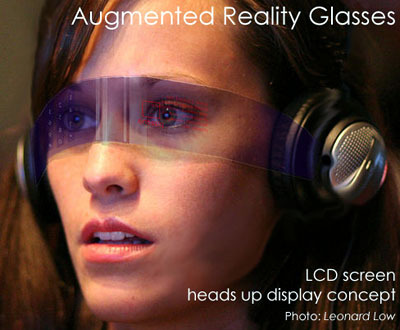 For instance, an AR user might wear translucent goggles; through these, he could see the real world, as well as computer-generated images projected on top of that world. Augmented reality is the ultimate interface to a computer because our lives are becoming more mobile. We’re getting more and more away from a desktop, but the information the computer possesses is applicable in the physical world. Microsoft’s 2019 Exciting Future Vision Montage shows the future of augmented reality. Microsoft Office Labs engineers are thinking about the future in the year 2019 and what we should be looking forward to. The video address the question: "How will emerging technology improve our productivity in the years ahead?" There is quite a bit of augmented reality in here, but also mobile/ubiquitous computing, advanced office applications with easy to use interfaces and visualization. A great vision of how current augmented reality prototypes may evolve in the years ahead. 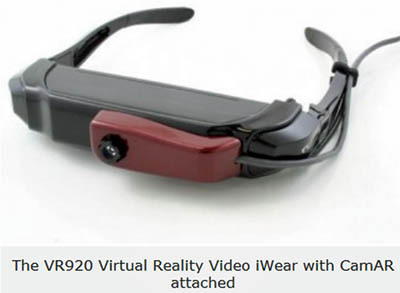 The iWear VR920 video visor from Vuzix (formerly Icuiti) promises an "as if you were there" virtual world experience, incorporating 3D technology, head tracking, microphone and audio in a wearable display equivalent to a 62-inch screen viewed at a distance of 9 feet. Partnering with Metaio, which is known for its artificial reality software, Vuzix demonstrated some fun applications of the technology at the 2009 Game Developers Conference in San Francisco. These included superimposing a simple scenery constructed with LEGO with 3-D animated characters that literally pop out of the scene, or 3-D additions to printed books to make the scenery seemingly come alive. The company has recently showcased new accessories to compliment its 3D visor. Dubbed the Augmented Reality Accessory Kit, the add-ons consist of a clip-on USB camera and a wand-like input controller which the company promises will "allow the user to perceive and interact with the real world in ways they have never dreamed of before". The clip-on USB camera – the CamAR, – attaches onto the iWear goggles and allows the user to see the real world, accurately tracking external objects as well as the user’s position in 3-D space. Why play video games on your flat panel when it can be brought right into your living room? Mobile phones will be the first to commercially offer augmented reality applications. Smartphones, which include GPS hardware and cameras, are crucial to driving the evolution of augmented reality. For example, movie posters will trigger interactive experiences such as a trailer on an iPhone. Developers have recently released augmented reality apps for the Google Android-powered HTC G1 handset. Brian Selzer, co-founder of Ogmento, a company that creates augmented reality products for games and marketing, recognizes the need for augmented reality to go mobile. Ogmento is working on several projects coming in the near future to help market mainstream movies with augmented reality smartphone apps. Layar, a company based in Amsterdam, released an augmented reality browser for Android smartphones in June. The Layar browser looks at an environment through the phone’s camera, and the app displays houses for sale, popular restaurants and shops, and tourist attractions. 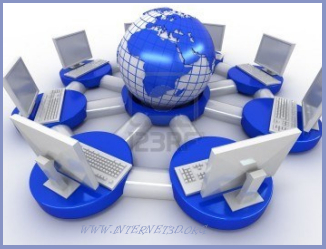 This is the first time media, internet and digital information is being combined with reality. You know more, you find more, or you see something you haven’t seen before. Some people are even saying that it might be even bigger than the web. Nokia is currently developing an augmented reality application named ‘Point & Find’, which involves pointing your camera phone at real-world objects and planting virtual information tags above them. Users of Point & Find can then see each other’s tags on their screens. This comes essentially to crowdsourcing an augmented reality. This year we’re feeling a real urgency to work on augmented reality because the hardware is finally catching up to our needs. The future of augmented reality: Anywhere Augmentation and supercharged version of reality. As you look around, they will overlay data about what you’re looking at, like the ‘heads-up’ displays used by fighter pilots. Virtual reality would be turned inside out: rather than retreating into a make-believe virtual world, inhabitants of augmented reality will be living in real space but with layers of data overlaid to deliver a supercharged version of reality. The goal of augmented reality of course is for it to reach a state in which it does not rely on a pre-downloaded model to generate information. We must be able to point a mobile device at a city with which it’s completely unfamiliar with, download the surroundings and deliver relevant information instantly. This concept has been called ‘Anywhere Augmentation‘. For example in the next couple of years, we’ll see games that take augmented reality out into the streets. Consider a scavenger-hunt game that uses virtual objects. You could use your phone to "place" tokens around town, and participants would then use their phones (or augmented-reality enabled goggles) to find these invisible objects. The rise of Anywhere Augmented Reality will then lead us closer to total immersion in virtual realities as well as in 3D Internet. With the general adoption of AR, it will become increasingly difficult to distinguish between what’s real and what’s virtual. Will Augmented Reality increase the quality of our lives with the mentioned "supercharged version of reality", or will it just add to the ever more confusing information overload?